Below I have listed reference material about the WASP that might be useful for all who desire more information. Many of these sources I have used for the background information presented on this website. This list is not meant to be a complete arrangement. I'm still searching for more and I would be very happy about everyone who can recommend further interesting material. Personnel, Civilian, Wearing of the WASP uniform, AAF Regulation No.40-9, Headquarters, Army Air Forces Washington, 14 February 1944 .. Complete list of all official WASP uniform clothes that were issued or could be purchased optionally. Explains how and when wearing of which WASP uniform attire was prescribed. Contains illustrative drawings of parts of the uniform. Women Pilots with the AAF 1941-1944, AAF Historical Study 55, AAF Historical Office, Headquarters, Army Air Forces, 1946. "The study describes the adoption of the programs for training of women pilots, the uses made of them, and the attempt to incorporate them into the Army." A Wardrobe for the Women of the Army by Erna Risch, Q.M.C. Historical Studies No. 12, Historical Section General Administrative Services Division Office of the Quartermaster General, 1945. Detailed description of the development of all WWII uniform garments of Army Nurses, WAACs/WACs, WASP, Army Hostesses and Librarians. Life Magazine, July 19, 1943 . This issue contains a cover story about Jackie Cochran’s Training Center. Some female pilots heard about this program the first time through this Life magazine article and were encouraged to join it. Garden City Publishing Co.,Inc. (1943) Description of several women's wartime organizations (for example Red Cross, AWHRC, AWVS, AER, USO, and many more) especially their uniforms and insignia. Contains information of Nancy Love's WAFS as well as Jackie Cochran's WFTD. Acwell Press (1943) A complete guide to the women's services in the Armed Forces of the United States (WAC, WAFS, Waves, Marines Reserve, Spars). Detailed information about their purposes, recruiting requirements, payment, uniforms etc. with the intention to encourage more women to become ladies in uniform. Who's Who & What is What in the Women's Civilian Volunteer Organizations by Affilinated Aetna Life Companies, (1942/43) . Fold-out brochure that presents colored drawings of the uniforms of several WWII civilian women's organizations plus pictures of their special insignia. For example, Red Cross, AWVS, WAFS, USO and OCD. Type: Drama / War . 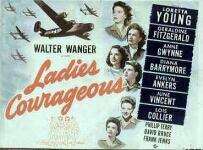 This movie tells the story of the Women's Auxiliary Ferrying Squadron. It doesn't stick to the real facts, but nevertheless nice to watch. It pleads for the military status of the female pilots. Type: Drama The movie is about the life of the British pioneer aviatrix Amy Johnson, a very famous flyer during the 1930's. Amy Johnson ferried fighter planes for the RAF during the War and died on duty. Although this film is about a British female pilot who did the same job as WAFS/WASP performed in America - it is interesting to watch. On Final Approach. The Women Airforce Service Pilots of World War II by Byrd Howell Granger, Falconer Publishing Company (1991) . Most extensive work about the WASP program. This thoroughly documented narrative history gives excellent background information, tells anecdotes, lists interesting statistics and includes many fantastic pictures. Yankee Doodle Gals –Women Pilots of World War II by Amy Nathan,National Geographic Society, 2001, ISBN 0-7922-8216-7 Excellent overview about the history of WASP with many vivid interesting details and b&w photos. Interesting close-ups about some female pilot's biographies. by Molly Merryman, (1998) The author draws upon military documents, congressional records, and interviews with the women who served as WASP during World War II. Weingarten's businesscompany www.1903.com is specialed in selling very high quality reproductions of US Wings from the 20th century (including WASP wings). In Defense of a Nation - Servicewomen in World War II by Major General Jeanne M. Holm, USAF (Ret. ), Vandamere Press (1998) This book contains excellent overviews of several WWII women's organization (like WAVES, SPARS, WAC, ANC, NNC, WASP, Women Marines) illustrated with nice black and white photographs. The part about the WASP is written by Lieutenant Colonel Yvonne C. Pateman, USAF (Ret.). The chapter about the WASP is in Volume 2. Love at first Flight by Elizabeth Strohfus as told by Cheryl J. Young, Vera Press, 1994, ISBN 0-87839-090-1 . The impressive life story of WASP Elizabeth Strohfus who even flew a jet when 71 years old. Many interesting details about her life as WASP and several b&w photos. by Ann L Cooper, Ann L. Cooper, Dorothy Swain Lewis, 1999 This book is about the life of Dorothy Swain Lewis, an extraordinary woman. She was an artist and sculptor, a teacher and mother and a WASP. She has created the bronze statues to her fellow fliers at the Air Force Academy and the Air Force Museum, among other sites. This book includes pictures of her statues, paintings and cartoons. by Ann B. Carl, 1999 The WASP Ann Carl was the only American woman to test-fly experimental planes during WWII and the first woman to fly a jet. This memoir is extraordinary and a spirited story about staying aloft in a male-dominated profession. Flying Higher. The Women Airforce Service Pilots of World War II by Wanda Langley, Linnet Books, 2002, ISBN 0-208-02506-5 . The book tells the story of the WASP seen through the life of Marie Michel, a 19 year old WASP who died while serving her country. The author has conducted extensive interviews with former WASP members and includes the insider's details of their adventures, training and service. Fly Girls directed by Jacqueline Shearer, 60 min. Type: Documentary . This PBS Home Video documentary is part of their "American Experience"series. It shows how mothers, wives, working women and others joined the Women Airforce Service Pilots and made an important contribution, test-piloting aircraft, ferrying planes and logging millions of miles of airtime. Women of Courage. The Story of the Women Pilots of World War II by K.M. Productions, (1998) This Video tells the story of the Women pilots of World War II. Former WASP who saw this documentary praised it as very well done. Free a Man to Fight! Women Soldiers of World War II by Mindy Pomper & RYS Productions, Inc. (1999) Great documentary that features rare archival footage interwoven with intimate interviews of women who served during WWII. Includes interviews with some former members of the WASP. WASP on the WEB . Most extensive site about WASP that offers many information. Excellent list of resources that provides many articles about WASP or written by WASP from WWII up to now and official documents online. It also contains a lot of other extras like audio and video clips, WASP paper dolls, a WASP coloring book, a quiz and much more. Information about the WWII - WASP Museum. Only the arrangement is a little bit confusing. United States Air Force The USAF museum offers many detailed information about women pilots in WWII: historical background, biographies of several female pilots , real player format video, official sources, photographs and uniforms. Texas Woman’s university website for WASP Excellent homepage that offers historical information, photographs, oral history projects, a big bibliography list and much more. The TWU has an own extensive archive about the history of WASP. The American Experience: Fly Girls A part of the Public Broadcasting Service (PBS) website that gives additional information about their documentary "The American Experience:Fly girls". The homepage includes interview transcripts, a timeline, an interactive map, a teacher's guide. Women of Courage This homepage has a good historical overview, nice stories from and about several WASP and a WASP quiz. It also offers some products like DVD/VHS, WASP-Artprint, T-Shirts.